Our primate cousins have surprised and impressed scientists in recent years, with revelations about monkeys’ tool-using abilities and chimps’ development of complex sign language. But researchers are still probing the question: why are we humans the only apes that can talk? That puzzle has now led to an insight into how different non-human primates’ brains are “wired” for vocal ability. So how do our primate brains differ? That comparison is exactly what Dr Dunn and his colleague Prof Jeroen Smaers set out to do. They ranked 34 different primate species based on their vocal abilities – the number of distinct calls they are known to make in the wild. They then examined the brain of each species, using information from existing, preserved brains that had been kept for research. “It turns out there’s this signature within the brains of primates that relates directly to their vocal repertoire,” said Dr Dunn. Bottom of his ranked list of primates was the proboscis monkey, with four known distinct calls. 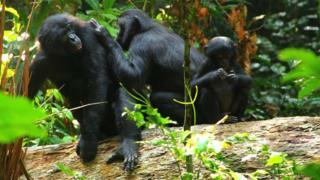 The apes – led by the bonobo – were at the top; bonobos make 38 distinct calls and it has been suggested that their use of vocalisations are a glimpse of the early evolution of language. These more vocally adept apes, the study revealed, had relatively large areas of the brain known as cortical association areas – essentially brain regions which receive sensory input and decide what to do with it. “They’re a kind of filter to control the decision-making process,” explained Dr Dunn. Also, and perhaps most importantly, bonobos and the other more vocal apes – including chimpanzees – had much larger parts of the brain dedicated to control of the tongue. This suggests, the researchers say, that while our primate cousins may well be sufficiently smart to develop and understand complex ways of communicating, the voluntary control of their “vocal apparatus” – rather than their intelligence – is the limiting factor. Since we cannot study our extinct human ancestors, scientists all over the world still look to our closest primate cousins to fill the gaps in our knowledge about the evolution of something as complex and crucial to humanity as language. Understanding how the brain is wired in these different primate species and how that relates to vocal ability, could, suggested Dr Dunn, “go some way to helping us understand how the complex voluntary control over vocal production may have evolved in humans,” ultimately leading to our own ability to speak.